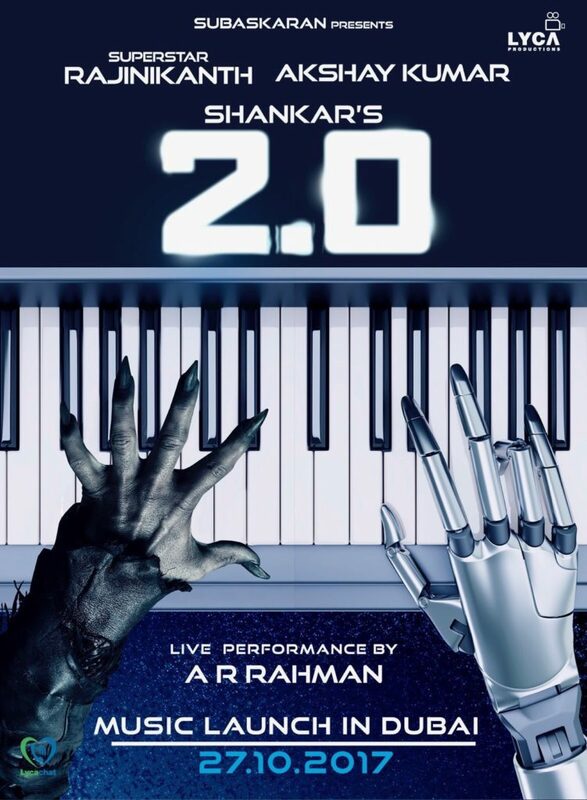 Rajinikanth, Akshay Kumar, Director Shankar and Music Director A.R Rahman Crazy Combination movie ‘Robo 2.0’. The Indian Movie lovers are eagerly waiting for this Sequel of the Robo Movie ‘2.0’. The ‘Robo 2.0’ Movie is going to release in the next year 26th January 2018. No the makers of the ‘Robo 2.0’ Movie are planning for a huge Audio release Event. The Audio Event is taking place with Crazy Stars. The Robo 2.0 Movie Audio release date is confirmed that the Movie lovers awaiting for the News. The ‘Robo 2.0’ Movie is made with a huge budget which is ever highest on Indian Cinema Screen and now the makers are planned for a huge audio release event as well. The Audio release event of the movie is held in Dubai at Burj Khalifa Park. And the news is that all the fans are competing to take a part of the event, so there a huge demand for the tickets of the event. The news is trolling in Kollywood that the Audio release event ticket price is around Rs.60,000 per each ticket. Along with Hero Rajinikanth and Akshay Kumar all the unit of the ‘Robo 2.0’ movie are take a part in the event so it’s got much hype. The other end The Makers are spending huge money for the audio event and want to recover the money in return with the event that’s why they planned event grandly, there is a rumor trolling. This is clearly shows that the Robo 2.0 movie makers want to cash the all events of the movie that the money they are spending on it in the form of returns. The Makers want to make the audio release event grand success and with this they want to capture the Attention of All. The Movie makers are also planning huge promotion campaign for the Robo 2.0 Movie and they don’t want to compromise in this. All of sudden Robo 2.0 Movie fever starting soon. Rajinikanth mania going to rock south and Indian Cinema. Let’s wait and see how the Sequel of the Robo Movie ‘2.0’ going to create wonders at Indian Box Office. Can’t wait to see the Magic of Indian Spielberg and Cameroon Director Shankar and Oscar Winner A.R.Rahman’s combination Musical Magic. The Audio Release Event date confirmed as 27 October in Dubai. In this event AR Rahman is going to perform a Live Song. There is a Chances of Dubai King is going to attend the event as a chief guest.